The first Snoopy set has released in Thailand in1997.They are Snoopy All Stars set. 4 toys with Snoopy play sport on the top can connect together like jigsaw. The Snoopy World Tour 1 have launched on 21Aug- 1Sep 1998.Give out 7 Snoopy for week .They featuring 28 designs of Snoopy dressed in different 28 countries costume. This set become one of the most popular Mcdonald’s collectibles with more than 1,000,000 pieces sold in Thailand. They are all sold out in very short time. 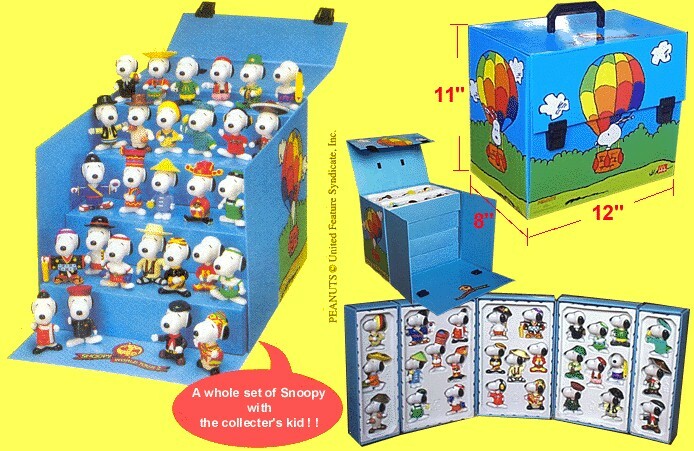 Mcthai also give special Snoopy house box for collectibles but it is very rare now. After a year, Mcdonald’s have launched Snoopy World Tour 2 featuring new 28 designs, although they get 12 same countries with the old set but all in new design. They are more colorful than the old one.Also have 4 special handbills in limited edition. zijn die snoopy dingen er nog? where i can buy my missing Happy meals of Snoopy?pls. help me to look for it Tnx! Where can i buy the first set of snoopy world tour? Recently just collect eleven second hand from the flea market. I am now in Kuala Lumpur, Malaysia. Hope any buyer in Malaysia can let me know to get these sets. why cant you have them again. 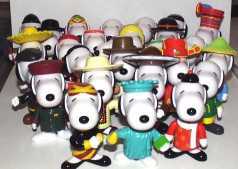 eu would like buy this colection of snoopy , tell me how. How much can u offer for McDonald Snoopy world Set 2! Highest bigger gets it. I also have extra what country do you want and your offer? How much Maam?, and isi it still in good condition? I would like buy hello kitty make up case anyone sell it?